The 2017 Gourmet Grazing festival is October 7. 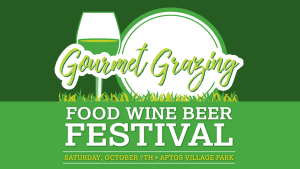 The 14th annual Gourmet Grazing on the Green—Saturday, Oct. 7 at Aptos Village Park—features more than 75 vendors including local restaurants, caterers, wineries, breweries, and spirits distilleries. Proceeds benefit the Santa Cruz Cancer Benefit Group (SCCBG). The event is from noon to 4 p.m. Buy $65 tickets at New Leaf Community Markets (downtown, Westside or Capitola locations) or online or pay $70 at the door if it’s not sold out. Adult admission includes food, drinks and a souvenir wineglass. Kids 10 and under are free; kids ages 10-20 are $35. Proceeds from SCCBG’s events benefit these local cancer support and research organizations: Hospice of Santa Cruz County, Jacob’s Heart Children’s Cancer Association, Katz Cancer Resource Center, researchers from UC Santa Cruz, the Teen Kitchen Project, and WomenCARE Cancer Advocacy. For over 20 years, the Santa Cruz Cancer Benefit Group has been dedicated to improving the quality of life for people living with cancer in the Santa Cruz community, by raising money to support beneficiary organizations and fund new research that will provide possible cures and better solutions for treating cancer. They have raised more than $22 million since 1995. For more information on the event, see sccbg.org. Parking is limited at Aptos Village Park. There is free shuttle service every 15 minutes from Cabrillo College, where people can park for free. 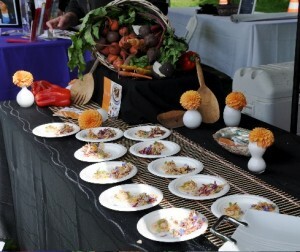 The 13th annual Gourmet Grazing on the Green—Saturday, Sept. 24 at Aptos Village Park, features 70-plus vendors including local restaurants and caterers, other food businesses, and local wineries, breweries, and spirits distilleries. Proceeds benefit the Santa Cruz Cancer Benefit Group (SCCBG). The event is from noon to 4 p.m. Buy $65 tickets at New Leaf Community Markets (downtown, Westside or Capitola locations) or online http://sccbg.org or it will be $70 at the door if it’s not sold out. If you have a group of 10, you can get tickets for $60 each. Adult admission includes food, drinks and a souvenir wineglass. Kids 10 and under are free; kids ages 10-20 are $35. Participating restaurants, farms, and food vendors for 2016 include The Crow’s Nest, Café Cruz, Café Rio, Real Good Fish, Niman Ranch, SunRidge Farms, Ashby Confections, Zameen Mediterranean Cuisine, Cremer House, Ella’s at the Airport, Surf City Sandwich, Hula’s, Hollins House and Sid’s Smokehouse. Participating wineries, breweries and distilleries include Alfaro Family Vineyards and Winery, Beauregard Vineyards, Hallcrest Vineyards, Kathryn Kennedy Winery, Santa Cruz Mountain Vineyard, Sones Cellars, Wargin Wines, Wrights Station Winery, Santa Cruz Mountain Brewing, Discretion Brewing, Seabright Brewery, New Bohemia Brewing Co. and Venus Spirits. For more information on the event, see www.sccbg.org. There is free shuttle service every 15 minutes from Cabrillo College; parking is also free. The 12th annual Gourmet Grazing on the Green, Saturday, Sept. 19 at Aptos Village Park, has more food and drinks than ever before! As of press time, there are 73 vendors including local restaurants and caterers, other food businesses, and local wineries, breweries, and distilleries. Proceeds benefit the Santa Cruz Cancer Benefit Group (SCCBG). The event, which is from noon to 4 p.m., usually sells out so it’s smart to buy tickets ahead of time. Buy $70 tickets at New Leaf Community Markets (downtown, Westside or Capitola locations) or online. If you have a group of 10, you can get tickets for $60 each. Admission includes food, drinks a souvenir wineglass, and live music. Participating restaurants, farms, and food vendors for 2015 include The Crow’s Nest, Café Cruz, Café Rio, Solaire Restaurant and Bar, Real Good Fish, Niman Ranch, Smart Chicken, New Leaf Community Markets, Ella’s at the Airport, Zameen Mediterranean Cuisine, and Sid’s Smokehouse. Participating wineries, breweries and distilleries include Alfaro Family Vineyards and Winery, Beauregard Vineyards, Cima Collina, Hunter Hill Vineyard & Winery, Kathryn Kennedy Winery, Santa Cruz Mountain Vineyard, Sones Cellars, Bonny Doon Vineyards, Santa Cruz Mountain Brewing, Discretion Brewing, Seabright Brewery, and Venus Spirits. Non-alcoholic beverages will include drinks from Tulsi Teas, Pacific Coffee Roasting Co., and Pure Valley Water. Proceeds from SCCBG’s events benefit these local cancer support and research organizations: Hospice of Santa Cruz County, Jacob’s Heart Children’s Cancer Association, Katz Cancer Resource Center, UCSC’s fellowship program for cancer research, the Teen Kitchen Project, and WomenCARE Cancer Advocacy. There is free shuttle service every 15 minutes from Cabrillo College Lot E; parking is also free. For more information on the event, see sccbg.org or call (831) 465-1989. On Twitter? Follow me @santacruzfoodie. It’s time for the 11th annual Gourmet Grazing on the Green, where you can enjoy a large amount of first-rate food (from local restaurants and caterers)—plus beverages from local wineries, breweries, and distilleries—in a friendly and festive atmosphere. And you will be helping support the very worthwhile Santa Cruz Cancer Benefit Group (SCCBG). 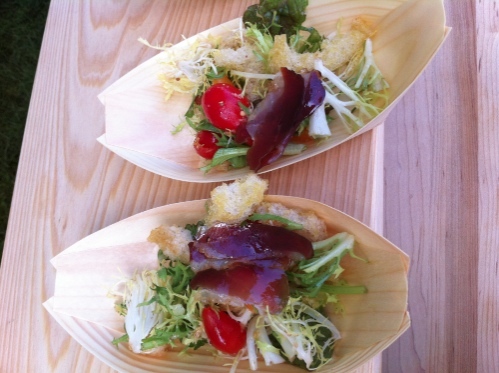 Gourmet Grazing is Saturday, Sept. 27, 2014 from noon to 4 p.m. at Aptos Village Park. Purchase $65 tickets at New Leaf Community Markets (downtown, Westside or Capitola locations) or online. If you have a group of 10, you can get tickets for $50 each. Admission includes food, wine, beer, a souvenir wineglass, and live music. The event is outdoors; last year it actually rained for a short while, but everyone just ran under the few sheltered spots and it stopped as quickly as it started. New this year is a “big bottle silent auction,” courtesy of new festival partner Santa Cruz Mountain Winegrowers Association (SCMWA). There will also be a bottle booth operated by SCMWA, an alliance of more than 60 wineries promoting wine produced from the Santa Cruz Mountains Viticultural Appellation. Some of the food creations that participants will taste have been created with products generously donated by event sponsors Coke Farm, Watsonville Coast Produce, and presenting sponsor New Leaf Community Markets. Some of my favorite dishes from last year’s festival included Café Rio’s Rio Prawn Spring Roll (included mung bean noodles, sprouts, carrots, green onion, basil, and mint) and Johnny’s Harborside’s Gazpacho Seafood Cocktail (calamari, scallops, shrimp, garnished with baby romaine and a watermelon radish). For more 2013 highlights, see my recap article. There are more than 25 participating restaurants, farms, and food vendors for 2014 including The Crow’s Nest, Shadowbrook, Café Cruz, Café Rio, The Whole Enchilada, Solaire Restaurant and Bar, Hula’s Island Grill, Santa Cruz Fish Co., Everett Family Farm, MacKenzie Bar & Grill, Friend in Cheeses Jam Co., Redwood Hill Farms, The Penny Ice Creamery, and The True Olive Connection. 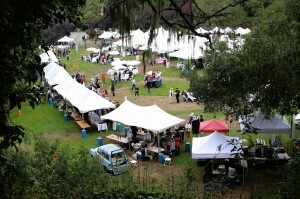 More than 25 participating wineries, breweries and distilleries include Venus Spirits, Alfaro Family Vineyards and Winery, Beauregard Vineyards, Burrell School Vineyards, Hunter Hill Vineyard & Winery, Santa Cruz Mountain Brewing, Santa Cruz Mountain Vineyard, Seabright Brewery, Sones Cellars, Bonny Doon Vineyards, and Kathryn Kennedy Winery. 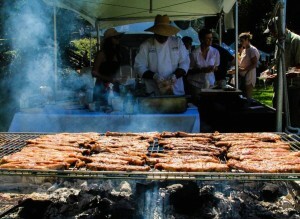 Proceeds from SCCBG’s events, including this year’s Gourmet Grazing, benefit these local cancer support and research organizations: Hospice of Santa Cruz County, Jacob’s Heart Children’s Cancer Association, Katz Cancer Resource Center, UCSC Cancer Research, the Teen Kitchen Project, and WomenCARE Cancer Advocacy. Over the last decade, SCCBG has distributed more than $1.5 million to directly support the Santa Cruz community. There will be a raffle, with ticket sales benefiting SCCBG. Prizes include jewelry, restaurant gift certificates, a wetsuit from O’Neill, and SCMWA Wine Passports. There is free parking and free shuttle service from Cabrillo College Lot E.
Yesterday the number of restaurants involved increased to 14—great news for the local community! Here’s the skinny: customers buy a $50 product that includes dinner and a movie for two. The tickets can be redeemed any Monday through Thursday evening, except holidays and special events. When you purchase your Date Night package, you select which restaurant you are buying a ticket for (they are mostly in Santa Cruz, plus a couple in Aptos), but you can decide later which movie theatre you’re going to of the three in the “Nick Family.” Each restaurant gives customers a certain value to spend on dinner–usually $50. For more information, see the Nick’s Date Night web site. Tickets for “Date Night Santa Cruz” all cost $50 regardless of the restaurant, and can be purchased at any of the partner restaurants or at the box offices for The Nick, Del Mar Theatre or Aptos Cinema. If you’re on Twitter, follow me @santacruzfoodie. 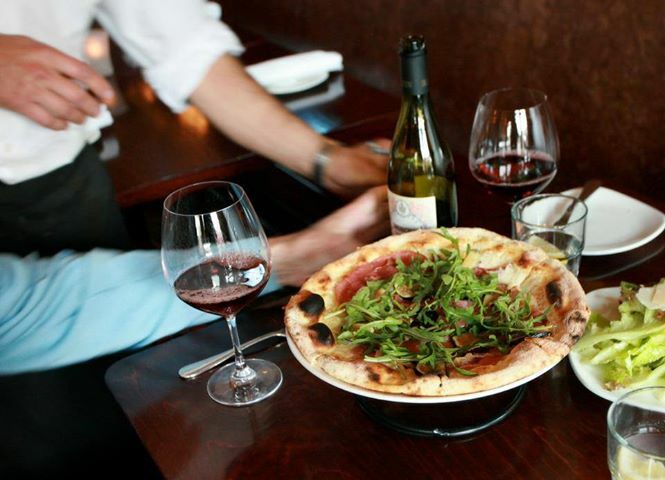 The fifth annual Santa Cruz Restaurant Week ends on Oct. 9; you have two more nights to dine at more than 30 local restaurants offering three-course dinners for $25. Read details in my event preview and recap of my 2013 Restaurant Week dinner at Hula’s. Haven’t decided which restaurant(s) to visit? Some highlights: Pearl of the Ocean is participating for the first time, and this Sri Lankan venue is reportedly gaining lots of new fans with its delicious vegan and vegetarian cuisine. The Restaurant Week menu at Red Restaurant and Bar includes food PLUS a 3 oz. glass of wine with each of its three courses. Café Rio’s offerings include appetizer choices such as Rio Prawn Spring Roll featuring carrots, green onion, basil, mint, and hoisin dipping sauce (I enjoyed this tremendously at the recent Gourmet Grazing on the Green) and Caprese Salad. The restaurant Chocolate’s choices include Artichoke Shrimp Salad, Spumante Lemon Swordfish, and Gelato alla Crema with bittersweet chocolate sauce. La Posta is offering entrees such as Corn Tagliatelle with peppers, escarole, capers and parmigiana and Quail al mattone with potato-chard gratinata and green olive salsa. 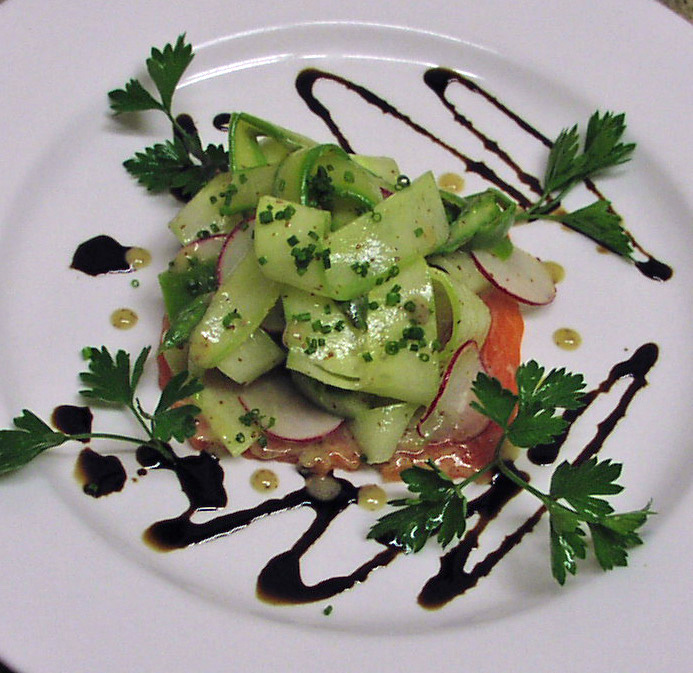 Check out more menus and information at the Santa Cruz Restaurant Week web site. 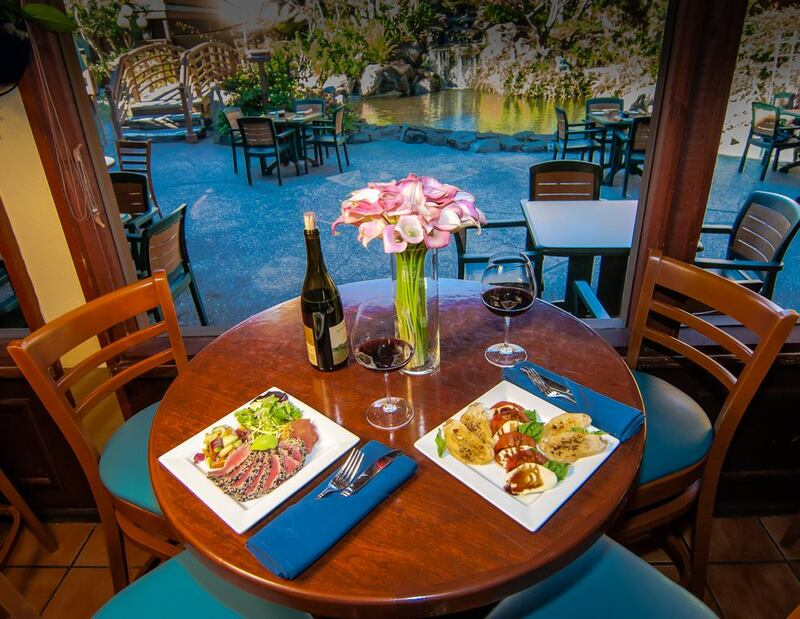 Foodie alert: it’s time for the fifth annual Santa Cruz Restaurant Week where more than 30 local restaurants – from Aptos, Soquel and Capitola to Santa Cruz, Scotts Valley, Ben Lomond, and Felton – serve three-course gourmet dinners for only $25. And you can win a free Santa Cruz Restaurant Week dinner through my web site! Read end of article for details. Special menus are offered Oct. 2-9, 2013, and typically include three options for each course: appetizer, entrée, and dessert. Customers choose one selection from each course. The 2012 Restaurant Week was very popular and a lot of fun for those of us who participated as customers! Restaurant reservations are recommended but not required. I will post a few menus and at least one review in the next few days. For more information, visit the event web site. This contest is open to readers of examiner.com and santacruzfoodie.com, but employees of Examiner.com are not eligible to enter. Either way, the entry deadline is Thurs. Oct. 3 at 9 a.m. I will pull a name from all entries and notify the winner by email. Center Street Grill’s 2013 Restaurant Week menu includes entrée choices of Grilled Salmon Puttanesca with capers, tomatoes, kalamata olives, mashed potatoes, and green beans, Seafood Fettucine with crab, shrimp, smoked salmon, mushrooms, and lemon cream sauce, and Grilled Pork Loin Chop with blue cheese & peaches, mashed potatoes, and asparagus. The annual Gourmet Grazing on the Green features a wonderful atmosphere, amazing food, and lots of delicious wine and beer. The 10th annual Gourmet Grazing, a sell-out, was held Saturday Sept 21, 2013 and raised important funds for the Santa Cruz Cancer Benefit Group. Everyone had a great time, even with the rainy weather! Read my preview article. If you missed it this year, I recommend planning ahead for 2014. Buy your tickets early, either online or at New Leaf Markets. Because only a limited number of tickets are sold, the festival doesn’t get overly crowded. It’s enjoyable for families (I brought my young daughter) and individuals of all ages. Here are some highlights from the 2013 festival to whet your appetite for 2014! I must confess I had seconds of both of the above; they were that good! The Whole Enchilada / Haute Enchilada: Delicious and refreshing Peruvian Ceviche with shrimp, Peruvian corn, onion, clam juice, sweet potato, mango, cilantro, habanero chile, and fresh lime juice. East Side Eatery (Pleasure Pizza’s newest spot): Chicken Pozole which was hearty and satisfying, especially given the weather. It had a fun “add your own toppings” spin including green onions, queso fresco, and jalapenos. Apparently the version at the restaurant itself also includes avocados, so I’m sure it’s even better there! Kathryn Kennedy: the winery poured a few exclusive bottles of their 2009 Estate Cabernet Sauvignon, for the lucky few that had a chance to taste before it was all gone! SCCBG has funded cancer research and local groups — including many that support people living with cancer — since 1995. The organization was started by a small group of friends who used to play tennis together once a week; they had each lost a relative or friend to cancer and wanted to do something to make a difference. The first event the group hosted was a Spring Forward Against Cancer Tennis Tournament and Celebration; these tournaments are still held each year. Proceeds from SCCBG’s events, including this year’s Gourmet Grazing, benefit these local cancer support and research organizations: Hospice of Santa Cruz County, Jacob’s Heart Children’s Cancer Support and Services, The Katz Cancer Resource Center, UCSC Cancer Research, and WomenCARE. The annual Gourmet Grazing on the Green, with many local wines, a few beers, and lots of gourmet food cooked by local chefs, raises vital funds for the Santa Cruz Cancer Benefit Group (SCCBG). Last weekend’s event—the 9th annual Gourmet Grazing on Saturday September 15—actually sold out several days in advance. It’s a great event and I highly recommend buying your tickets early next year (they are traditionally sold at New Leaf Community Market, and $65 each or $500 for 10). The organizers do limit the number of tickets sold, which makes for a very pleasant environment. It doesn’t get too crowded to enjoy the event, and it still raises a lot of money. In fact, this year’s Gourmet Grazing raised more than $65,000 (up from $56,000 in 2011). Admission includes food, wine, beer, a souvenir wineglass, and live music. Other participating restaurants included The Crow’s Nest, Beast BBQ, Café Ella, Hula’s Island Grill & Tiki Room, The Penny Ice Creamery, Shadowbrook Restaurant, and Zameen Mediterranean Cuisine. Participating wineries and breweries included Alfaro Family Vineyards and Winery, Burrell School Vineyards, Hunter Hill Vineyard & Winery, Santa Cruz Mountain Brewing, Santa Cruz Mountain Vineyard, Seabright Brewery, Sones Cellars, and Vino Tabi.